By now, illuminating an aquarium with energy-saving LEDs has become standard. New, complete aquarium sets are almost exclusively offered with matching LED systems, apart from that, converting an old, pre-installed aquarium lighting system (for example, with fluorescent tubes or metal halide lamps) to modern LED lighting may be more than worth it. Here are some LED systems and their applications. In our webshop, we offer the new matrix series made by manufacturer daytime, which can be equipped with LED modules individually. A more detailed presentation of the matrix lighting system can be found in our Aquascaping Wiki. 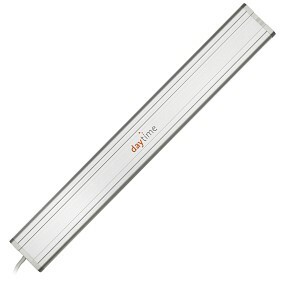 All LED systems offered by daytime are characterized by their flexibility. Small and oversized aquarium lengths are not a problem, and thanks to various available adapters, an apt solution for any kind of mounting is easily at hand. 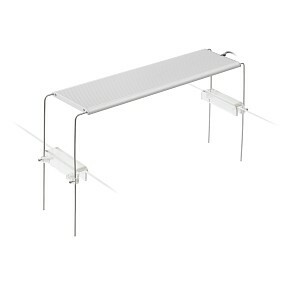 Even for common aquarium covers made by Eheim or Juwel, tailor-made conversions are possible by swapping the center rail. In addition, the color temperature allows you to choose between different shades of white and also illuminations with color content (blue and red light-emitting diodes). Of course the daytime LED systems are dimmable using a controller, and it is also possible to create a daylight simulation. When using coloured LEDs it is even possible to realize dawn and blue moonlight. Daytime scores points with flexible customization options, both in the way the lamps are mounted and in the color temperature selection. In addition, the matrix series offers a very good efficiency with a yield of up to 180 lumens per watt. The Trocal LED was created by Dennerle in cooperation with the renowned, German LED manufacturer GHL. The high-quality Cree LEDs, mounted in special ceramic sockets with good heat dissipation, have a service life of around 80,000 operating hours. An emission angle of 130 ° ensures a flat illumination. The manufacturer declares a light color of 5,500 Kelvin, which corresponds to warmer sunlight. However, two LED strips in different shades of white (cold and warm white) are installed, which are controllable. Thus, different white light colors and a daylight cycle with sunrise and sunset can be realized. Usually the Trocal LED is installed as a mounted light. Using the Retro-Fit-Kit the Trocal LED can be installed into T5- or T8 tube sockets and furthermore easily adjusted in height (see picture). Anyone who attaches great importance to stable and reliable production and outstanding durability, is well advised to use the Trocal LED. The design of the lamp is functional. The color temperature is a warmer white tone. 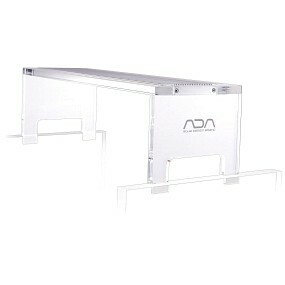 This LED lighting made by ADA is a preciously designed mounting light for aquariums with an edge width of up to 60cm. As the name "Aquasky" already implies, it almost looks as if the light is hovering above the aquarium tank. 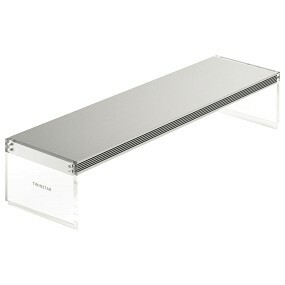 The reason for this are the elegantly designed mounting brackets made of acrylic. The LED lights can furthermore be combined with a mirror unit, which further increases the light output in the background and creates a unique optical effect. The "Moon" variant is even more powerful and equipped with matt acrylic brackets. As always, ADA presents a high-quality product with a very aesthetic design. Works very well in combination with an open OptiWhite glass aquarium. The RGB Solar replaces the tried-and-tested ADA Solar lights, which had metal vapor bulbs (HQI), with LED technology. Thereby much emphasis is placed on colour reproduction. The LEDs simultaneously produce red, blue and green light, resulting in white light in the mixture. Colored objects in the aquarium, such as fish and aquatic plants, thus exude an enhanced colourfulness. The RGB Solar is a suspended light and can be used with tanks of an edge width of 60 to 90cm. As an accessory, shades are available which further enhance the light output by about 15%. They also serve as glare protection when sitting in front of the aquarium. 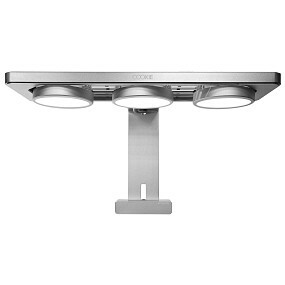 A contemporary LED replacement for the well-tried Solar lighting systems. The RGB component also provides a unique experience of light with more intense colors. 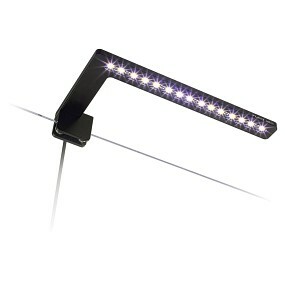 The E-series from Twinstar is an LED lighting system with RGB content. This means that in addition to the white and red, green and blue LEDs are installed, which enhance the color effect. This preciously designed over-tank light with acrylic mounting brackets is available for various aquarium sizes. 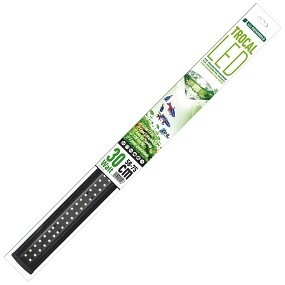 We have an article worth reading about the Twinstar LED Light in our Aquascaping Wiki. The Twinstar LED Light is a lushly designed over-tank light. The RGB LEDs provide color enhancement, but overall the lamp is not quite as bright to the human eye as pure white LEDs. The models COOKIE, PRO-I and E6+ from ATLEDTiS, are aquarium lights with RGB-W LEDs, which impress with a particularly good color rendering (CRI 90). While the E6+ is a classic clip-on lamp for nano-aquariums, the model COOKIE is suitable for tanks which are up to 60cm in length. 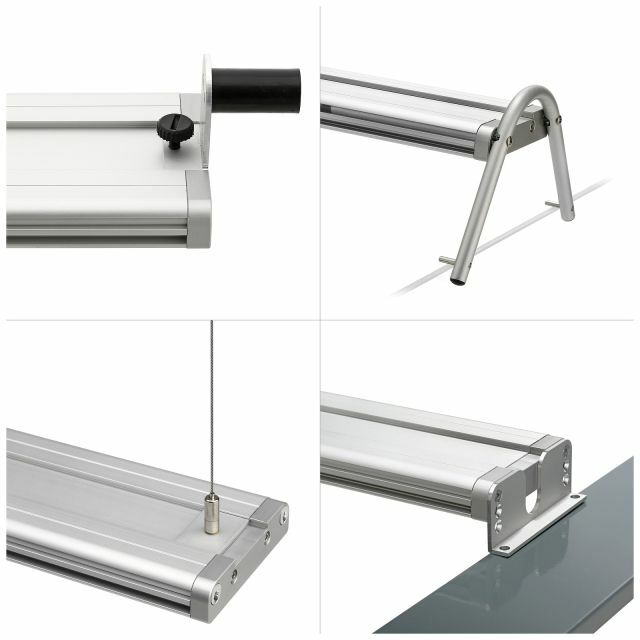 The aluminium holder can optionally accommodate up to three LED modules, which can also be moved around individually on the rail. Each module generates 600 lumens of luminous flux. The PRO-I is a bigger suspended light for 90 cm tanks. For attachment of the lighting, the HR Mounting System was designed. This allows the installation of one or more PRO-I lamps above tanks of 60, 90 or 120 cm in length. Using a remote control the lighting is dimmable, and furthermore, multiple lights can be paired with - and controlled by - one remote. Anyone who values good color reproduction through the use of RGB-W LEDs will find that with the high-quality LED systems from ATLEDTiS, solutions for various tank sizes from small nano tanks up to huge 120cm wide aquariums are easily available. Similar to RGB lighting from other manufacturers, the focus here is not so much on the brightness visible to the human eye as on the color enhancement of fish and aquatic plants in the aquarium. The Flexi Mini made by Azoo is a beautifully crafted, swivel-mounted over-tank light for small tanks with a volume from 10 to 30l. Especially on nano aquariums this lamp looks very discreet and not too massive. Furthermore you have the choice between a black or silver finish of the aluminium casing. A beautiful lighting for a nano aquarium with a light, sleek aluminium body. The swivel mechanism is quite handy for tank cleaning, it provides significantly more space and yet still enough light. Different series are available in Chihiros LED systems. 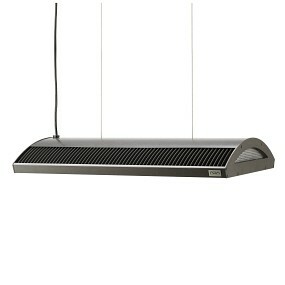 The A series includes mounted lighting systems between 20 and 120cm in length. The flat aluminium heat sink body is home to three rows of LEDs. The positioning of the lamp is done with short acrylic feet, so the lighting system is installed relatively close to the water surface. The A plus serise is better suited for use above heavily planted aquariums. It is available in four different sizes. In comparison to the regular A series, even more LEDs on a wider lamp body increase the brightness and improve illumination. The mounting of the A series plus is comprised of slim metal pins, which can be adjusted in height. So using this system with tanks containing a very high hardscape and emerse plant constructions -as it may be the case with a paludarium - is conceivable. Those who attach great importance to an intense color reproduction in the aquatic plants and fish, are well-advised with the RGB series. In addition to the white ones, additional, colored LEDs are installed here, which emphasize and brighten up colored objects in the aquarium. 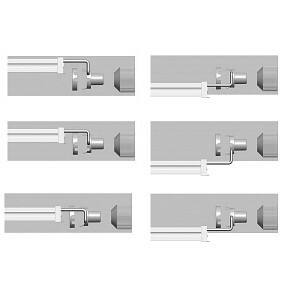 Similar to the A plus series the heat-sink bodies of the lighting system are installed using height-adjustable metal pins, fixing the light to the tank as over-tank lighting. Aquariums in the standard lengths 30, 45 and 60cm can be equipped with this lighting system. The C series was designed especially for nano tanks. It is a typical clamp-on light in black, available in various sizes. Furthermore it is splash-proof. All Chihiros LED series come with a manual dimmer which allows for an adjustment of brightness in seven steps. Thus, the intensity of the lighting can be adapted to the individual conditions on site. A remote control is optionally available. By use of convenient cable suspension kits and aluminium stands the lighting systems can be converted from mounted over-tank lights to suspended ones. Furthermore, Chihiros offers a special Wabi-Kusa LED. 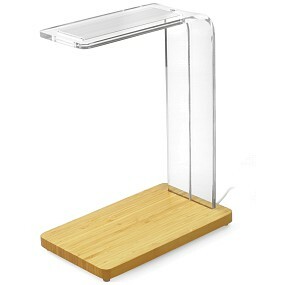 By a curved acrylic holder, this LED lamp is connected to a wooden base plate, on which a small nano aquarium or Wabi Kusa can be accommodated. LED lighting systems made by Chihiros impress with a very good price-performance ratio. But it should be kept in mind, that (with the exception of the C series) the lights are not splash-proof. An accommodation in a closed aquarium cover is therefore not possible. A big advantage is the dimming function which comes ex factory.